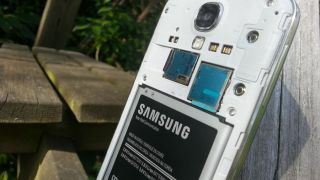 Samsung thinks it's made a battery breakthrough. We all know that smartphone battery life could be better, and Samsung reckons it's on to something with its latest engineering efforts - the company says its new tech could double battery life without increasing size. Business Korea has the news of a new graphene-coated silicon that could replace the graphite cathode in existing batteries. Essentially, that chemical mixture can hold a much bigger charge. It would mean having to charge your phone every other night rather than every night, but of course this would extend far beyond phones to reach laptops, tablets and all the other gadgets we rely on. Don't get too excited yet though - Samsung's report says the technology could take two to three years to make it into consumer products. For a new battery technology to work it needs to hit certain safety standards and be inexpensive enough to be commercially viable. It also needs to be able to withstand thousands of recharges, like existing lithium-ion packs. Getting that balance right is incredibly hard, which is why a lot of experimental new battery technologies never see the inside of a smartphone. Let's hope Samsung can make this one a reality.